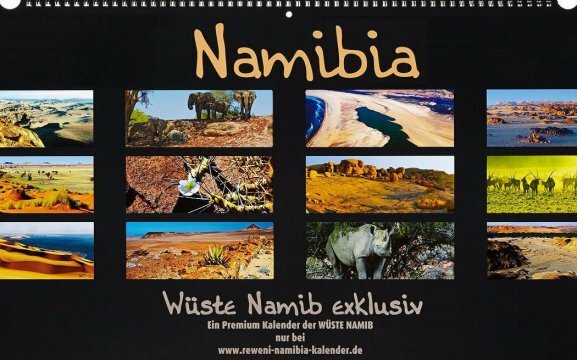 Anyone who holds the Reweni Namibia Kalender in their hands and turns around every month can feel its unique feature, an extraordinary product. It is particularly well-suited to expressing a good conscience, appreciation of the recipient, for example, to good friends and valuable business partners. Our calendar concept has presented for years the unique phenomena of the entire “Namib Desert”. The Namib is the most spectacular coastal desert on earth. For example, the southern part of the Namib is a pure sand desert, the “Great Sand Sea” and has received the very important award “UNESCO World Heritage Site of Nature”. In addition to this desert, the calendar is printed in the highest possible quality. We also supply large quantities and ship for you in Germany, Switzerland and Austria.